North America Forum»Forum ›Knights Fable ›General Discussion › Laocoon / Hermes / Zophiel for tank? Laocoon / Hermes / Zophiel for tank? 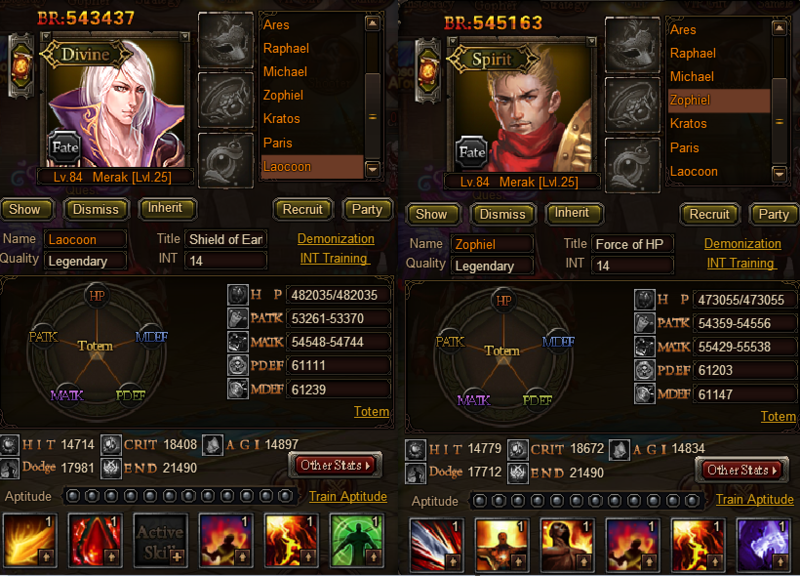 and Zophiel is 30% but for a Spirit Type hero .. isn\'t Spirit Type Heroes has LOW HP RATE? can someone help me out on this one ? 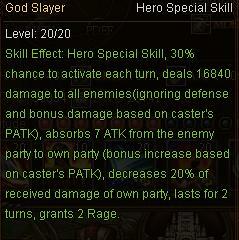 Which is Better as Tank + Healer + CoH Zophiel or Laocoon? any tested it? It as to be both from same player because there are many factors like int, godness, beast, nostrums, totems, apt, and more! I have 2 extremely similar apart from ones title is crit and other dodge. Still, I think Lacoon might be a better attacker than Kratos, Kratos makes 20% more damage than Lacoon. 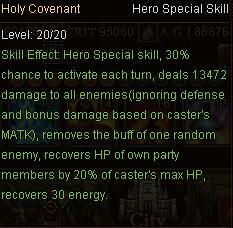 He takes the opponent damage and increase his own, Also, he decrease taken by 20%. Seems like Kratos is better but Lacoon have access to Ice Wrath! Thats just a really OP ability! Also, you might be able to use nostrums more efficiently. 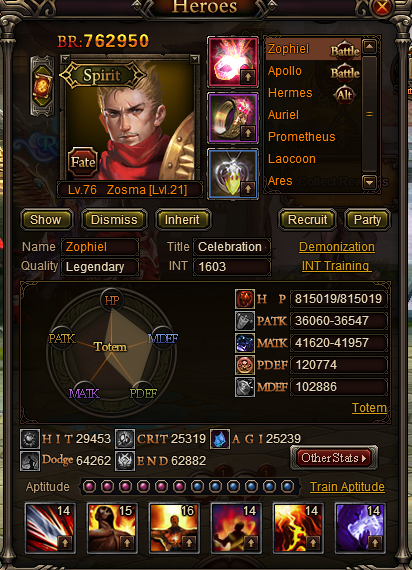 imo Zoph is either tied for 2nd best hero, or a close 3rd behind Uriel. Both decent I must say, between the two tankers,;the major difference would be their Bonus Tactical Side of their SS. 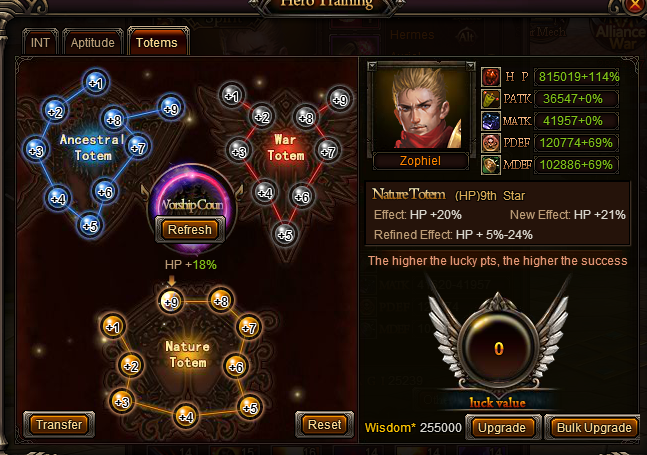 Zoph\'s stun is useful in HT and pvp fights that opponents don\'t have Stun Guard (Raphael, Rosefinch etc.). Laocoon is great for pvp use if his SS hits, it removes buffs (1st Target Nearest) and I believe it removes Char buffs and maybe opponent\'s BEGIN buff as well, not 100% sure though. But, sure enough it does remove Gab\'s buff though. Depending on how/where you want to use them. 2019-4-23 18:44 GMT+8 , Processed in 0.062698 second(s), 52 queries .